so you won't miss a thing. 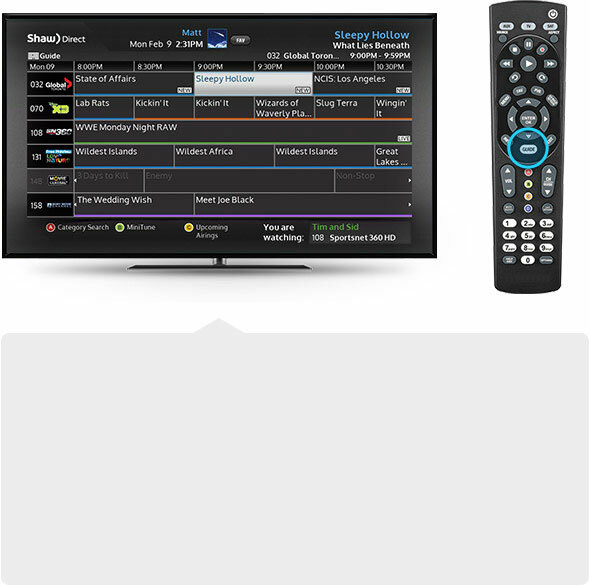 The Menu Bar is your gateway to all the great new features included with your Shaw Direct receiver. 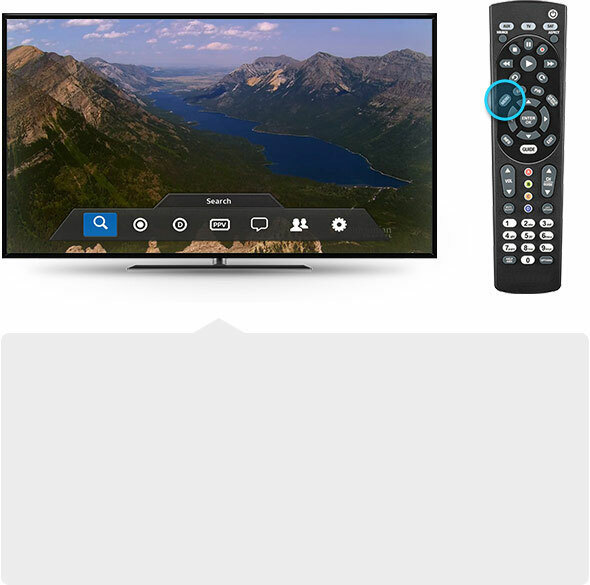 By pressing MENU on your remote, you can search for shows, customize your recording or reminder settings, access thousands of on-demand titles, see upcoming Pay Per View choices, read your messages from Shaw Direct, switch users, customize your settings and more. 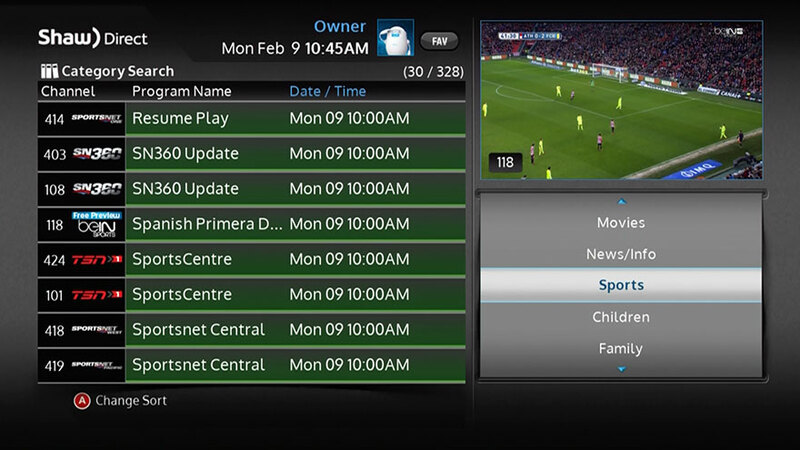 Press GUIDE to browse what's airing on all your channels. Unsubscribed channels are shown in grey, and can be hidden completely. To see further into the future, press GUIDE a second time - the video window will disappear and you'll see nearly 3 hours of listings. 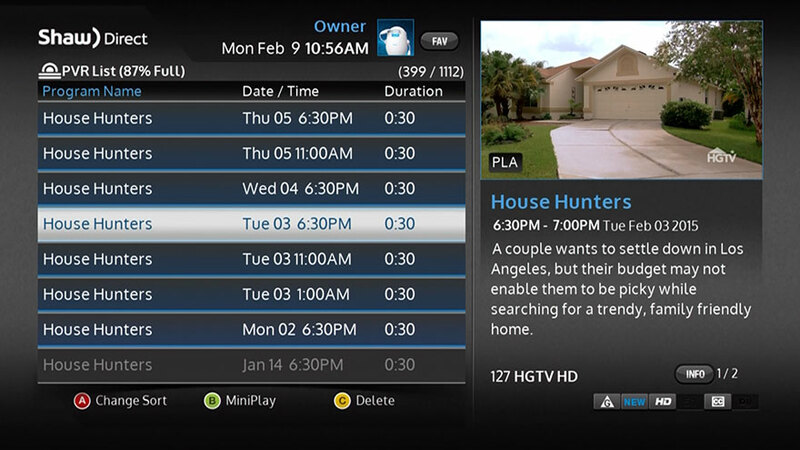 Check out the A, B, and C buttons shown at the bottom of the guide screen - they'll give you instant access to innovative ways to sort and tune your content, like by category or upcoming airings, for example. 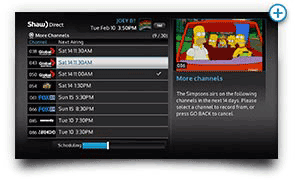 With nearly 30 HD Pay Per View (PPV) channels, there's always a hit movie or live event to watch on Shaw Direct. The PPV Store displays poster images for all titles, sorted by next airing. Onscreen instructions make it easy to phone-in your order, and the revamped guide notifications clearly confirm your purchases on-screen. 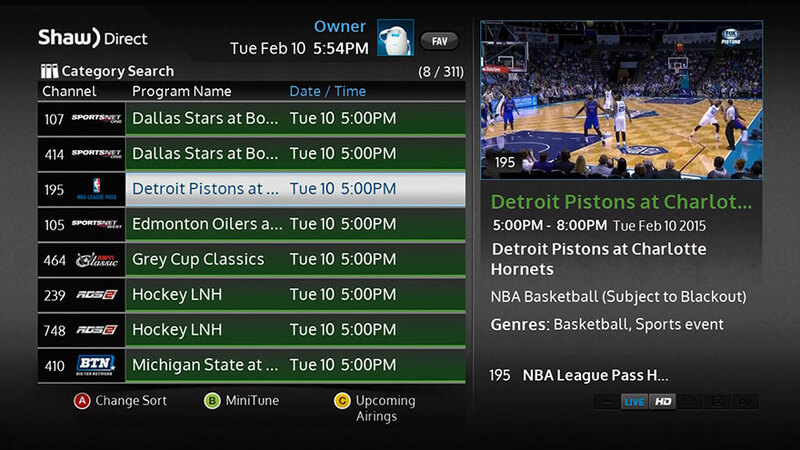 HDPVR 630 receivers now feature our best PVR Recordings List ever. 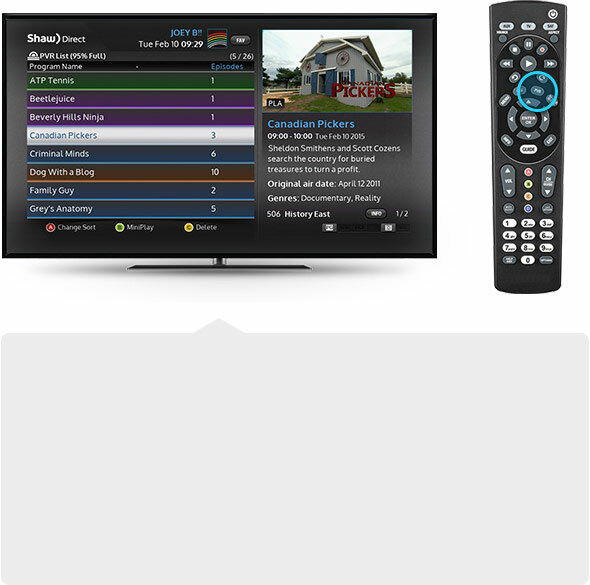 By pressing the PVR button on your remote, you'll enjoy different ways to sort your list (including by unwatched episodes) and the ability to quickly delete individual episodes, or entire series, by pressing the C button. Also, you'll automatically be asked if you want to delete a recording when you stop playback. Customize this prompt in the Preferences menu. 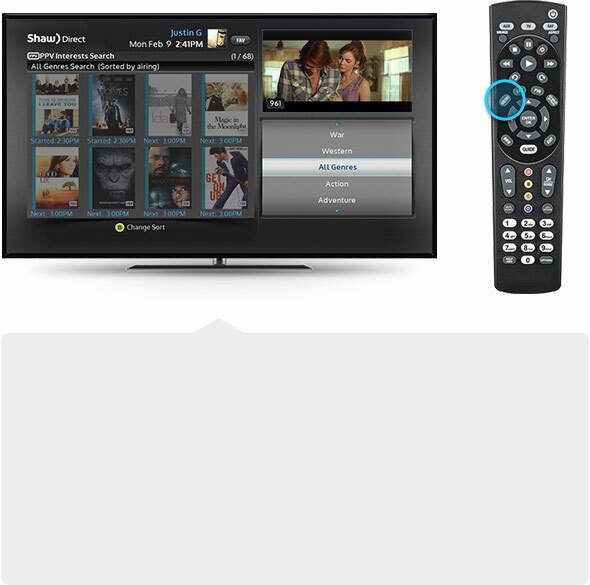 Shaw Direct On Demand is your source for movies, TV shows, music videos, and more, with much of the content available free with your subscription to the affiliated channel. With thousands of titles available, finding something great to watch has never been easier. 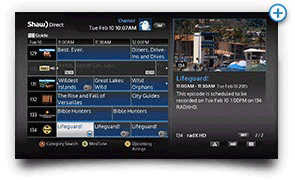 The new HD Guide offers detailed customization for up to eight different TV viewers in your home. 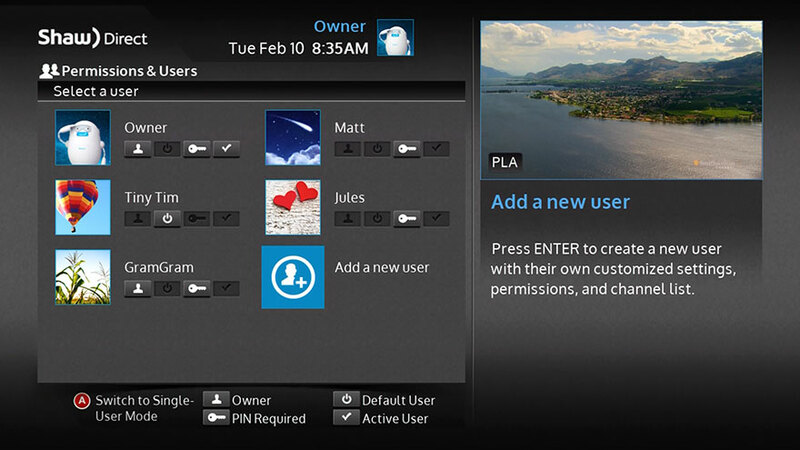 Create profiles that cater to specific needs, wants, tastes and controls. 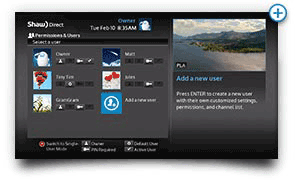 Each profile you create can have customized settings including channel list, font size, unsubscribed channels, recording delete prompt, caller ID, and more. 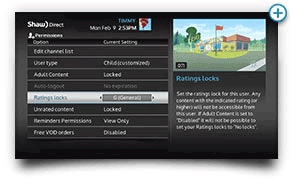 Accessibility options like Closed Captioning and Descriptive Video Service can also be adjusted for the needs of each viewer. 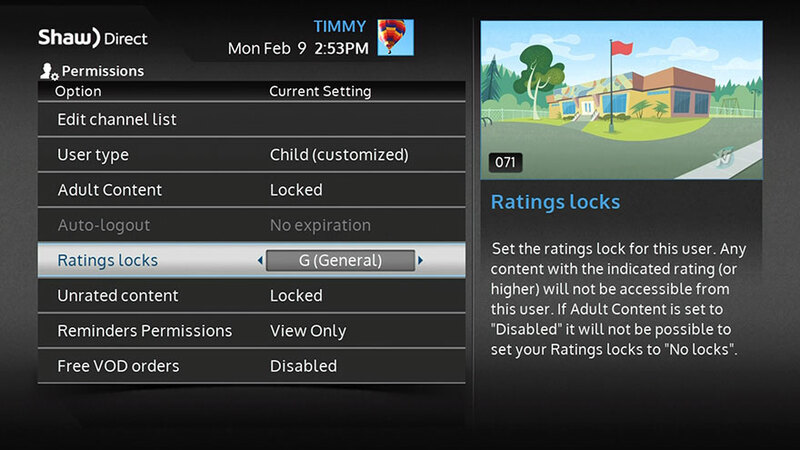 The HD Guide can also be operated in Single User mode, where a single PIN will unlock content. You'll still have access to most of the restrictions and settings listed above, but they will apply uniformly regardless of who is watching TV. Use the all-new Category Search to find current and upcoming programs in popular categories, like sports, movies, news, or kids programming on channels you are subscribed to. 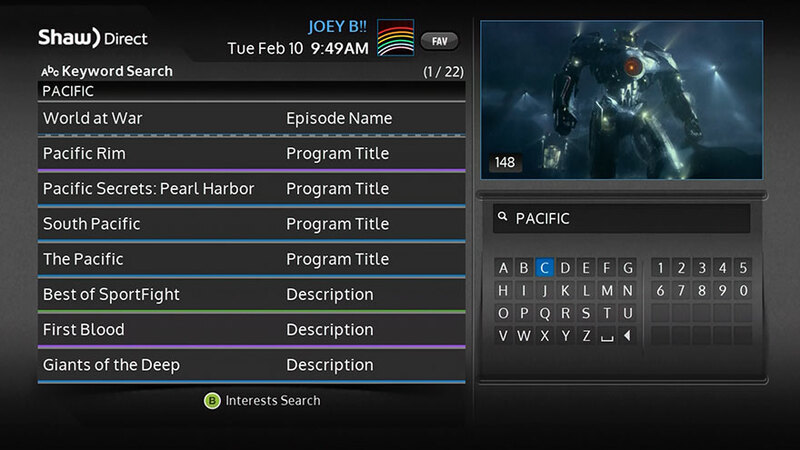 Use the on-screen keyboard to enter a search term such as program or episode title, actor, or description to see all matching results. Use T9 text with your remote for easier keyword entry. Finding the perfect music to listen to has never been easier. 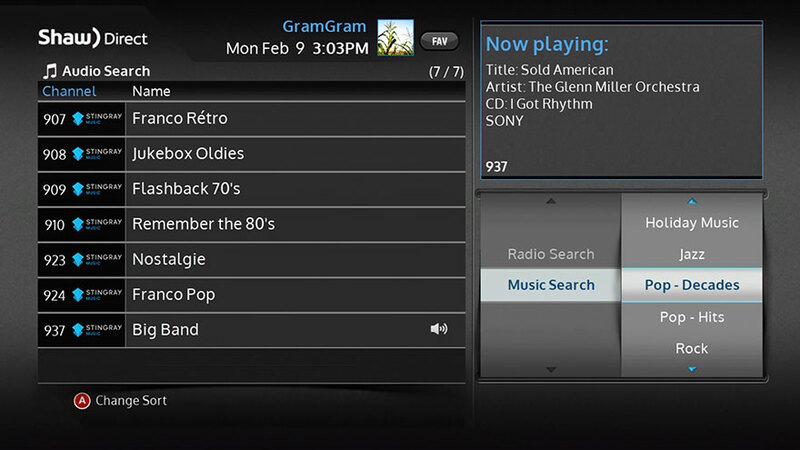 The enhanced Music Search lets you tune-in to 40 Stingray genres, and 57 radio stations from around North America, while remaining in the search screen to keep browsing. The new HD Guide is equipped with smart new PVR features for your HDPVR receiver, that help you manage, track and view your recordings with ease. 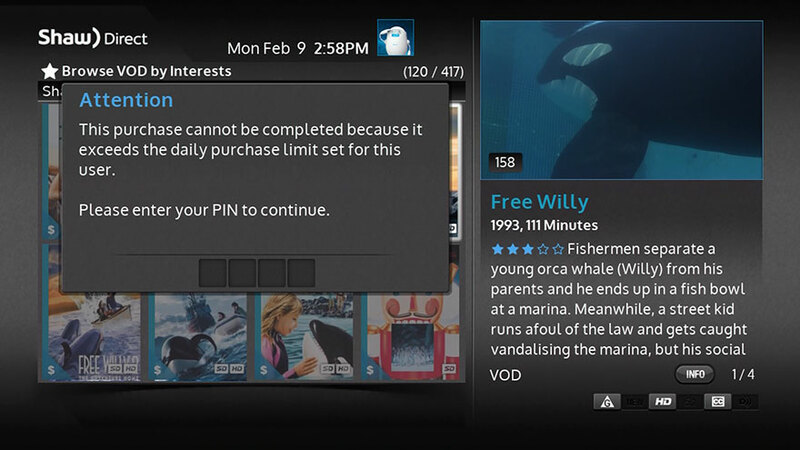 Your new Smart PVR now clearly displays the status of your recordings in text form. No more deciphering the meaning of various recording icons. Now, programs with a recording icon will also have a detailed description of the scheduled recording, or give reasons why a recording has been rescheduled. It's easy to modify your series recordings with a new shortcut built into the Program Options menu. Plus, you can now modify which channel a recording takes place on by using the "More Channels" selection in the Edit Recording Event menu. The revamped alert system will appear to tell you about upcoming auto-tunes or dual recording events. Clearer options are available to manage your viewing. Plus, you'll now be notified each time a recording starts or stops. MiniTune and MiniPlay are two features that will completely change the way you browse and watch television. 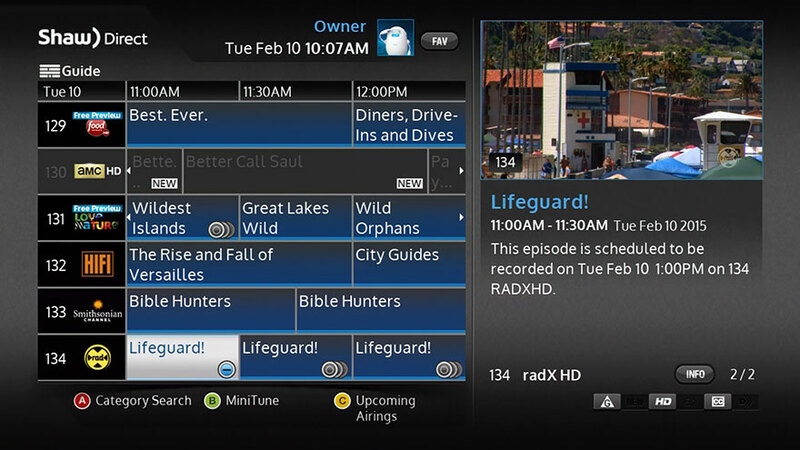 Start watching recordings while still managing your PVR list, and tune to a show you see in the guide, without leaving the guide at all. From the Guide and Category Search menu, pressing B will tune to the highlighted channel while keeping your current position in the menu. 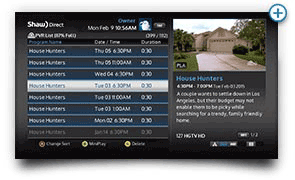 It's perfect for finding the right game or changing channels while planning out your recordings for the week. 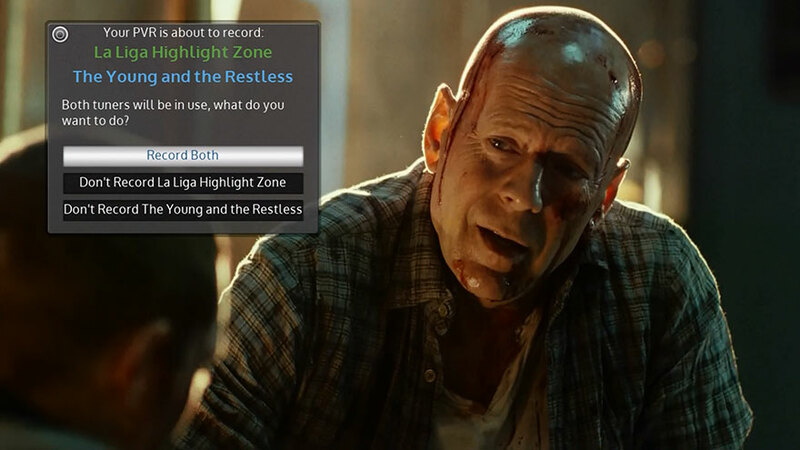 If you have an HDPVR, MiniPlay allows you to start playback of a recorded show while keeping your current position in the PVR List. 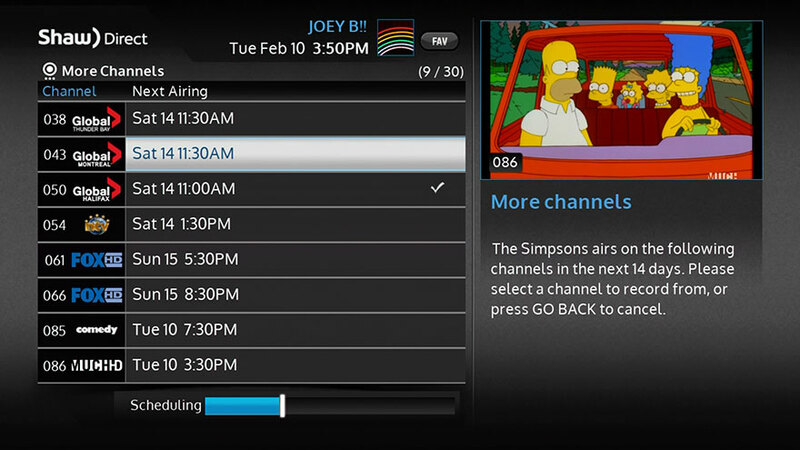 It's perfect for finding the right episode to watch, or starting playback while still managing your list. ⊡ Crave™ and all associated designs are trade-marks of Bell Media Inc. All other marks and images are the property of their respective owners. All rights reserved. ©2019 Shaw Communications Inc. All Rights Reserved. 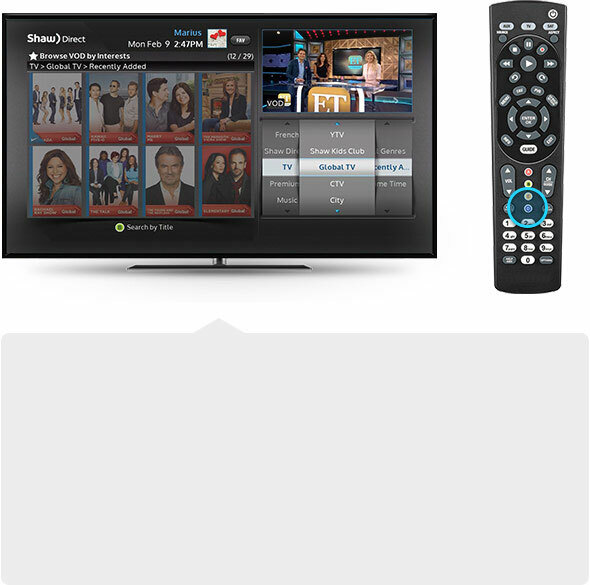 ∇ App and desktop access only available to Shaw Direct Satellite TV subscribers. 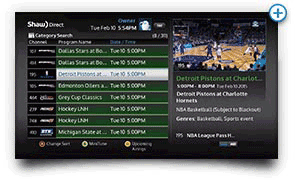 Channel availability is based on customer’s satellite TV subscription and Shaw’s mobile distribution rights. Subject to Internet connectivity. Subject to blackout restrictions.